Minion is a 12 year old, 16.1 hand registered Belgian WB gelding with four white socks and a star. Don't let his age fool you, Minion is only just getting started, literally. Due to owner circumstances, he was unstarted until this year, and backed as an 11 year old. He lived in a pasture his whole life, and has strong bone and clean legs and is an easy-keeping, hardy horse. 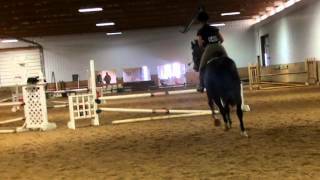 With a year and a half of riding under his belt, he is showing incredible jumping talent and willingness to please. Bred from top show jumping lines, he is stepping over 3'6" courses with lots of room to go higher. He has also been cross country schooling several times, attended a few schooling shows, and been on trail. With impeccable form and a naturally rhythmic stride, he could easily do hunters or eq but also has the scope and power to show jump or event. Now has flying changes but they are not auto yet. Can also do a clean dressage change if rider asks. He is schooling 3rd level dressage movements and showing talent for half steps. Though he is still green, he is more of a kick ride and could be suitable for an ammy or youth working with a trainer. He clips, bathes, loads, ties, etc. Barefoot with great feet and easy in the field. Rides alone or with company. Price will increase with mileage and training. Photo credit Patricia Majerle and Melissa Hughes.